20+ Elf on the Shelf ideas! So your Elf has come to visit once more, and you’re wondering what to do with him/her… If you’re anything like me, and you find yourself madly rushing around at 11:59pm trying to find something easy and quick to do, then this guide is for you! Without further ado, here are over 20 ideas which are quick, easy, and either free or cheap. I hope they help you! 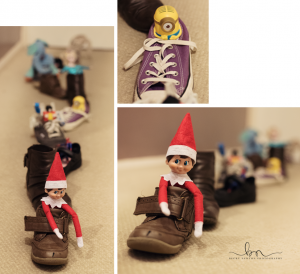 Simple and quick – take some shoes, make a line, and put your elf in the front shoe. Add other toys as necessary. 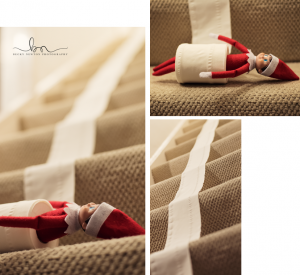 Place your elf inside a toilet roll, and push it down the stairs! Another straightforward one – smear a tiny bit of toothpaste around your elf’s mouth, and arrange the tube of toothpaste however you like next to the elf. This also works well with shaving foam. Your poor elf has a cold! 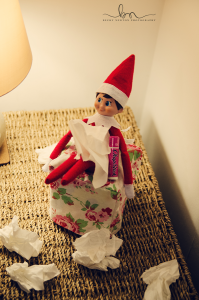 This is a great lazy option – just screw up some tissues and place them around your elf. Add any medicinal accessories you wish. This one takes a bit more time to prepare, but my kids loved it so it was worth the bit of extra effort. You’ll need some Jenga blocks, or Lego, or anything you can stack up to make a wall. You will also need another toy, and either mini marshmallows (which come in handy for another one of my ideas further down the page), or you could use small pieces of cotton wool. 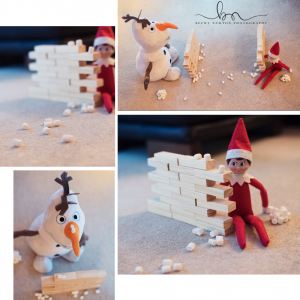 Build two walls and place your elf behind one, and the other toy behind the other. Scatter the marshmallows/cotton wool around so it looks like a snowball fight! Your elf is being very helpful and hanging clean washing on the line! I used a travel washing line for this, but you could use any string. Tie it between two points, and peg some of your kids’ socks along it. My son thought it was particularly funny that our elf had used his socks.